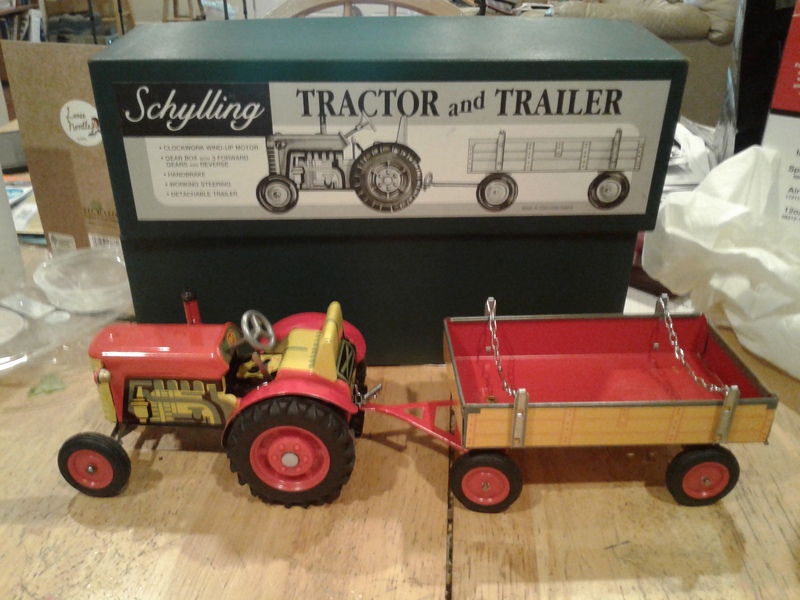 I just recently bought a Schyllings tin plate farm tractor and trailer made in Czechoslovakia with 3 forward gears and wind up clock motor at a thrift shop brand new in the box for $35, it’s really cool and goes very fast. It belong to a lady who bought it new and never opened it, the lady passed away and it was in a estate sale.It was missing the windup key but I called Schyllings and they sent me one for free, great customer service! Here’s a picture of my Zetor farm tractor and trailer from Schylling with 3 speed gear box and clock windup it’s brand new in the box. Hi Joseph, the tractor dates from the 1990’s & sell for around £20 to £25.